On this episode, we talk about the iconic 1985 John Hughes teenage comedy-drama film, The Breakfast Club, with Simple Minds' Jim Kerr. The Breakfast Club was written, directed, and produced by John Hughes and starred Emilio Estevez, Anthony Michael Hall, Judd Nelson, Molly Ringwald, and Ally Sheedy as the titular kids brought together by Saturday detention in fictional Shermer, Illinois. The film's spawned memes, quotable lines, and just last week became the subject of a retrospective look in a New Yorker essay by Molly Ringwald, entitled "What About 'The Breakfast Club'? Revisiting the movies of my youth in the age of #MeToo." The Breakfast Club's visuals are iconographic, with the film's poster being lifted by sources as varied as The Texas Chainsaw Massacre Part 2 and Archie comics. However, what's endured most from the 1985 movie has been the soundtrack, and in particular, Simple Minds' Billboard Hot 100 #1 hit, "Don't You (Forget About Me)." 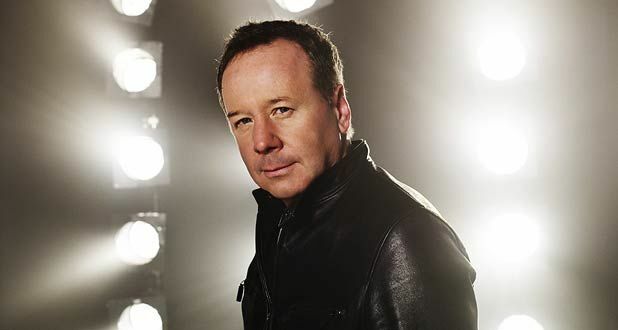 The song -- written and composed by producer Keith Forsey and Steve Schiff -- would be Simple Minds' biggest hit, while also one of the few songs not written by the band's vocalist Jim Kerr or keyboardist Charlie Burchill. Forsey had several instrumentals featured on the soundtrack, along with songs by Wang Chung and '80s soundtrack staple E.G. Daily. It's an impressive array of '80s pop, but Simple Minds' song playing over the closing credits and and Judd Nelson's raised fist, will forever be linked with the film.